This NOAA satellite image taken Friday, May 27, 2016 at 1:00 a.m. EDT shows scattered rain showers across parts of the Pacific Northwest and Great Basin due to a area of weak low pressure. Another area of showers can be seen across the Rockies due to a stationary front extending across Colorado. 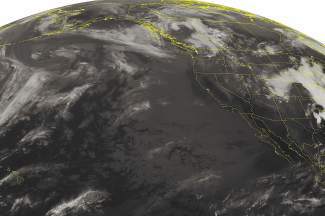 Mostly clear conditions continue for the West Coast and Southwest due to an area of high pressure, with partly cloudy conditions for the Northern Plains. DENVER — Several tornadoes were reported in eastern Colorado as storms moved across the state while some parts of the mountains got fresh snow. The National Weather service says five tornadoes were spotted in Cheyenne and Kit Carson counties Thursday evening. The storms also brought heavy rain, large hail and strong winds, which turned over several tractor-trailers and caused a roof to collapse in the town of Kit Carson. COLLBRAN, Colo. — Mesa County emergency management officials are evacuating people who live near a massive landslide area in the eastern part of the county after water from spring runoff began overflowing from a pond. Sheriff’s dispatcher Taylor Loo says other people in the area are being warned to be ready to evacuate, but no injuries or serious damage have been reported. A flood watch has been issued for the area, warning people of the danger of more landslides. Three people were killed when 35 million cubic yards of the Green River Formation faltered and slid down in 2014. The slide covers nearly a square mile atop the West Salt Creek valley. DENVER — Colorado authorities will be stepping up their drunken driving enforcement during the Memorial Day weekend. The Denver Post reports that the Colorado Department of Transportation is cracking down on DUI drivers with sobriety checkpoints from Friday through Tuesday. There will also be increased patrols in areas where DUIs are most likely to occur, including near bars and restaurants. The increased enforcement is part of the department’s “Heat is On” campaign, which is aimed at preventing people who have been drinking during the holiday from getting behind the wheel. State figures from 2007-15 show Memorial Day has the highest alcohol-related fatality rate of the year. Friday also marks the first day of Checkpoint Colorado, a 100-day summer enforcement period under the campaign. That program will run through Labor Day weekend. PUEBLO, Colo. — Pueblo authorities are looking for two suspects after a gunshot was fired at law enforcement officers conducting an unrelated traffic stop. The Pueblo Chieftain reports that nobody was injured during the Thursday morning incident. According to the Pueblo County Sheriff’s Office, two deputies and an officer with the Pueblo Police Department were conducting a traffic stop around 3:15 a.m. when a second vehicle drove by and fired a gunshot at them. The sheriff’s office says the vehicle sped off and was found a short time later with nobody inside. Witnesses say they saw three people run from the vehicle. Authorities have taken an unidentified woman into custody and are searching for two men. The office and deputies involved have not been identified. Authorities are still investigating. EVANS, Colo. — Residents of the Weld County city of Evans are praising a police officer who helped rescue their dog, which had been trapped in a crawlspace under a nearby home. The Greeley Tribune reports that Mike Linn’s 6-year-old dog Tanka got out after he left the gate to his home open and after four days he was sure she was gone for good. Evans Police Department’s community service technician Deidra Jesmer found the dog on May 18 after a neighbor called about hearing a crying animal under their home. Jesmer, with help from the Evans Fire Protection District, was able to crawl under the home and hook a net around the dog, pulling her out. Linn was cited for letting his dog out, but says the $55 fine is worth it to have his dog back. COLORADO SPRINGS, Colo. — A 40-year-old woman has died after suffering from medical issues in an El Paso County jail holding cell. The Gazette reports that Erica Klag died at a Colorado Springs hospital on Thursday after going into cardiac arrest at the jail on Tuesday. Klag was arrested on a warrant for failing to appear on traffic offenses. Police say on the way to jail Klag told officers she might be having a seizure. Medical personnel were called and she was cleared. She later went into cardiac arrest. Police say Klag was minimally restrained by police and sheriff’s deputies and that there was no indication of excessive force. The 4th Judicial District Attorney’s Office is investigating and an autopsy is planned for Friday. DENVER — Authorities have arrested a parolee in connection with a fatal shooting and fire at a building that houses a popular bagel shop in Denver. The Denver Post reported Thursday that 30-year-old Brian Scott Pattison was arrested on suspicion of murder and arson, as well as multiple weapons charges. Investigators say 29-year-old Shane Richardson was found dead in an apartment closet on the second floor of the building that houses Rosenberg’s Bagels and Delicatessen. Firefighters were called to the building early May 2, and investigators believe the fire started on the second floor. Rosenberg’s operates out of the building’s first floor below the apartment. Pattison is being held in the Las Animas County jail. A man who answered the phone at the jail said he couldn’t release any information about Pattison, including whether booking documents list an attorney.